Get this freshly found flight deal of ours and fly to Punta Cana for $450 r/t – with taxes – with Delta Airlines. Depart to the Dominican Republic from Los Angeles, CA and save at least $85 compared to any other airline we have checked. 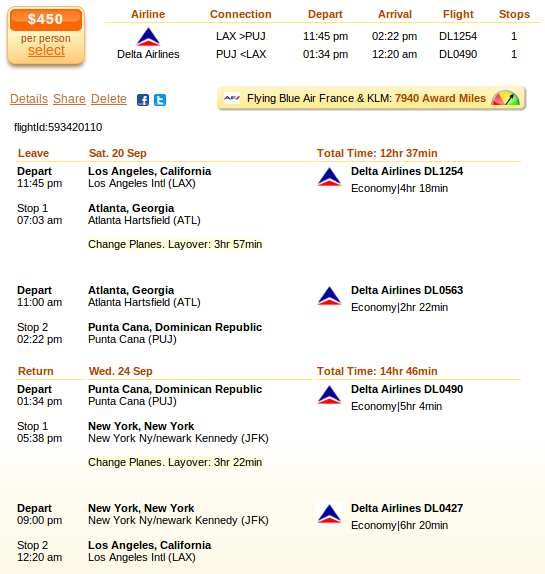 This Delta deal was provided by Faredepot and we have found it while searching on Travelgrove. Look for it in the box and keep in mind to compare the rates of as many merchants as you can, ti make sure you are purchasing the cheapest airline ticket to Punta Cana. Depart from Los Angeles International Airport (IATA code: LAX) on September 20 and fly back from Punta Cana International Airport (PUJ) on September 24 in 2014 and pay only $450. There is a stop in Atlanta, GA each way, the first is 3 hours 57 minutes long, the second is 3 hours 22 minutes long. Delta Airlines definitely offers the cheapest airfare deal to Punta Cana compared to any other airline that we could find. Air Tran, the company with the next best airline is $85 more expensive with its $535 flight and flying with the others costs even more. This entry was posted on Tuesday, April 29th, 2014 at 8:22 am and is filed under Airfare Deals. You can follow any responses to this entry through the RSS 2.0 feed. You can leave a response, or trackback from your own site.